fixed: removed use() call in TKS_ScriptEngine::lockGlobalCtx() thus fixing e.g. the class_yac.tks example. added: -nps, --nopackedscripts cmdline option which is used to keep sources as-is in tkx and tsl files (default is to strip comments and tokenize them to speed up loading). This option is useful if the application wants to load its own source code at runtime. fixed: tear down class order is now ok; the old code caused several invalid memory accesses. 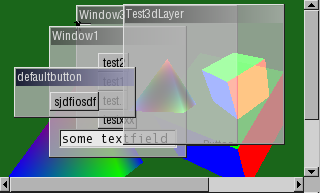 added: Texture.renderFixedText(). See the test_renderFixedText.tkx example (screenshot) (alternatively with emacs/courier font: test_renderFixedText-emacs.tkx). rewrote equalize_it.tkx to use 3 threads: a ringbuffer-filler, the SDL audio and the main thread. here is another tkui preview ! added: PointerArray.add(), insert(), delete(). You must wrap deletable pointers in a Value to keep track of the deleteme flag, otherwise a non-deletable reference will be added. Also see the pointerarray_list.tks example. added: ObjectArray.add(), insert(), delete(). If the argument is deletable and matches the array template type it will be used directly, otherwise it will be assigned to an instance of the template object (which is created if required). Also see objectarray_list.tks example. fixed: switch statements are thread safe and re-entrant now. also fixed a bug regarding default cases. fixed: break now also works within for loops. fixed: do..while, while, loop and foreach are thread safe and re-entrant now. fixed: the IMemberExpr is thread safe and re-entrant now. added: ObjectArray.insert, delete(). Also see the objectarray.tks example. added: ClassArray.insert, delete(). Also see the classarray.tks example. added: Function object expression, e.g. SomeFunction or SomeModule.SomeFunction or SomeClass.SomeStaticMethod. Also see thread_simple.tks example. I also fixed assignments from other script objects which consider multiple inheritance correctly now. Also see the class_assign.tks example. lib: is now replaced with the current $TKS_LIBRARY_PATH environment variable resp. registry setting. script libraries are included as-is resp. referenced (if using lib:) in a .tkx file. nevertheless, during startup each somefile.tsl occurence will be replaced by the contents of the .tsl file; this means that all files (both app and lib files) share the same namespace. libraries are searched in the current working directory, then in the path determined by the TKS_LIBRARY_PATH environment variable and finally in the registry key HKLM\\Software\\TKS\\TKS_LIBRARY_PATH (the registry setting only regards win32 ofcoz). see the tkui extension for an example on how to use libraries (or take a look at the file mentioned above). Also see the tks-examples/tsl example. note: mutexes are recursive so that re-entering a synchronized (and reentrancy-safe..) method from the same thread will not end up in a dead lock. this statements/expressions are now thread-safe. See the class_this.tks example. to get this all working, numerous internal threading/reentrancy fixes had to be done. an exception whose exception type is derived from UncriticalError will back-propagate exactly one stack frame. if there is no upper stackframe (global statements) or the upper stackframe (caller) does not catch the exception it will silently vanish. functions can return something and throw an exception at the same time thanks to the "new" pascal-style return=<expr>; syntax. added: zglClipPlane(int glplaneid, float eq0, eq1, eq2, eq3) function (works like glClipPlane() except that the plane equation argument array has been turned into 4 individual eq[0..3] arguments). Also see clipplane.tks example. added: support for YAC_CALL. Now the JIT compiler also works when compiling with the Openwatcom compiler, which uses its own __watcall calling convention per default. It seems that this also had an effect on the VC8 build environment. added YAC_CALL yac* method and global function decorator which is used to enforce __cdecl for 32bit environments. YAC_CALL is defined as "" if a 64bit environment has been detected or if __GNUC__ is defined. updated ying.tks to include YAC_CALL. also updated the tkopengl/tkfreetype2/tksidplay2/eqxmms and tkui plugins which were fixed to include YAC_CALL decorations now. The Watcom compiler seems to have problems with multiple inheritance; especially when using multiple vtables the generated code just crashes. After all; it (still) seems to be a pretty decent compiler: The watcom-compiled tks.exe outperformed the msvc-compiled one by up to 30% in some scripts (mostly string handling like split()/append()). Yet most of my benchmarkscripts showed a 5-28% advantage for msvc. forgot to give the RIO_RawReturn module a name..
forgot to give the ColorBox module a name..
fix: search order for variables was wrong in some codepaths; should now be localvar -> static class member -> class member -> globalvar everywhere. See variable_shadow.tks. added String.replaceRegion(int _startOff, int _endOff, String _replacementString). See string_replaceregion.tks. added SharedBuffer class. See sharedbuffer_create.tks, sharedbuffer_visit.tks. added onSegV signal callback and onSegVContinue handler (win32 only ATM). Default segv handler now prints adr and access type that caused the crash. initial release of DOG, the TkScript document(ation) generator (dog.tks, dog_html.tks). Basically it's a script that parses the output of tks -ee <script> and creates a set of HTML pages.